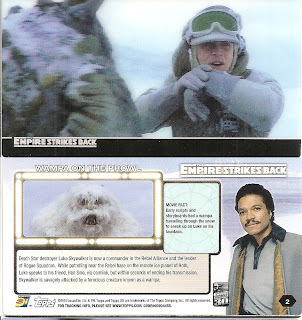 With just over 2 hours left in the year I open my final pack, a pack from the Star Wars: Empire Strikes Back 3D 30th Anniversary release. I was born in 1972 and the Star Wars trilogy is something that I connect with my childhood. When Topps releases a new Star Wars related set I always make sure to grab up a couple of packs. 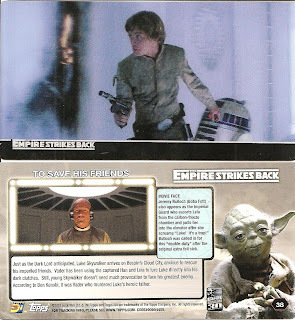 This release is rather small with a 48-card checklist, the set also includes sketch cards (1:72 packs) and autograph cards. Each box contains 24 packs with 3 cards a pack so you should be able to complete a set with just 1 box with sketch cards coming 1 in every 3 boxes. 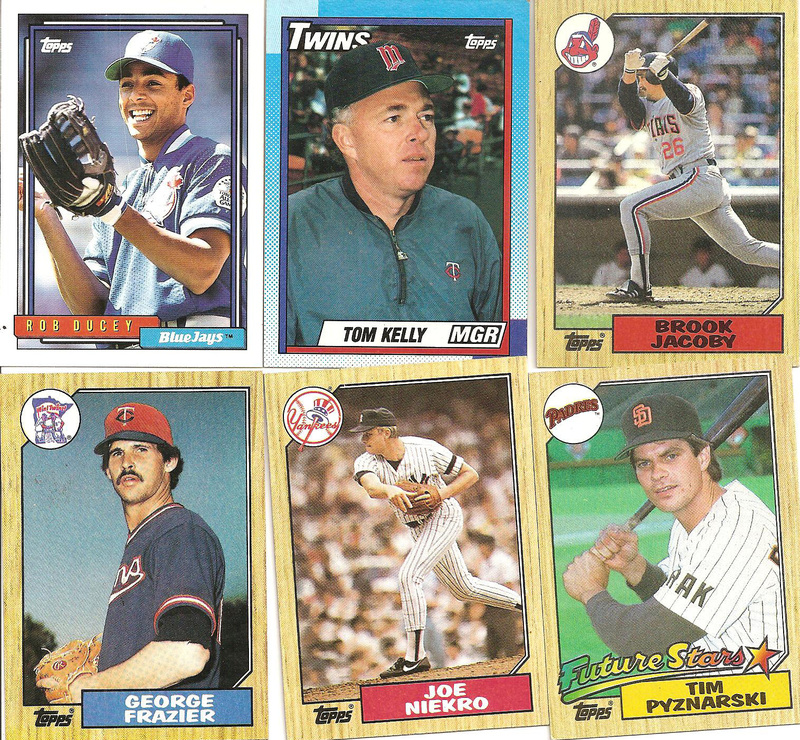 The cards are printed on a heavier stock in the tall boy fashion, what Topps usually describes as “Widevision”. Boxes are running under $50 each, I picked up this pack for $2 at Target. The first card shows Luke on his Tauntaun checking in after seeing the asteroid striking the ground on Hoth. 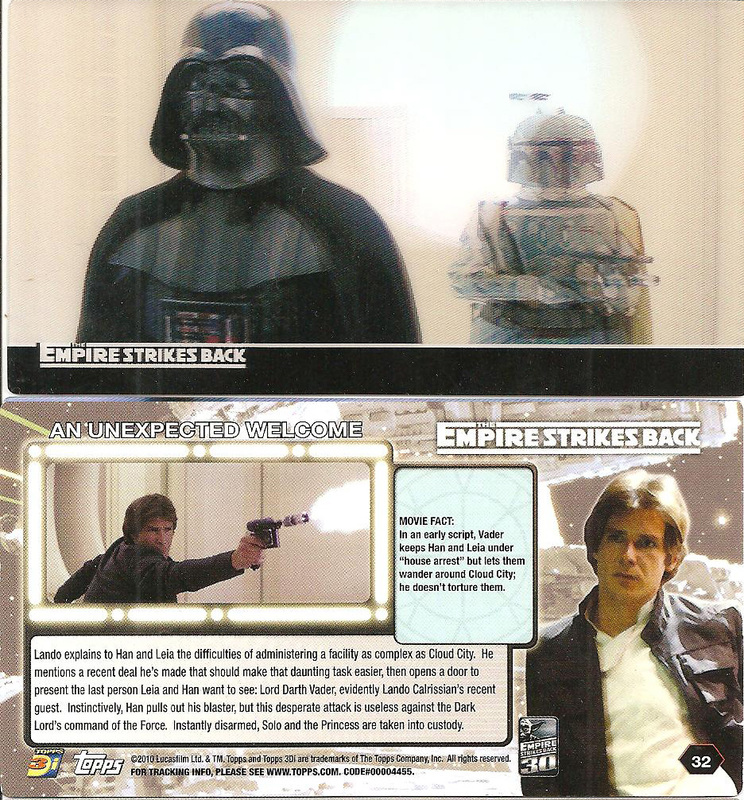 The back of each card contains a description of the scene, a trivia fact and two images. Next up is Vader and Boba Fett showing up at Bespin City. This card looks like there was a printing error which can be seen in the scan. Boba Fett’s images were printed farther apart than they were supposed to be to create the 3D image which left the image feathery and blurry. Topps continues to build on their UFC line with the upcoming 2011 Topps UFC Title Shot scheduled for an early May 2011 release date. Each box contains 12 packs and there are 14 cards per pack plus 1 auto, 1 auto-relic and 2 additional relic cards. Previous UFC releases ran around $100/box so I expect a similar price point with the newest release. Topps knows how to design a UFC product; the base cards are clean and actually remind me of previous Upper Deck baseball releases. 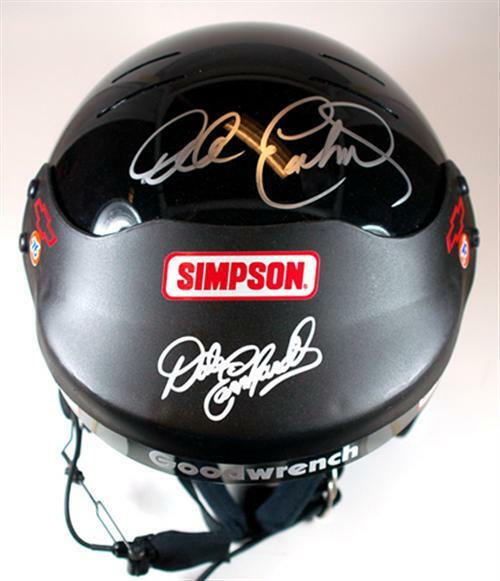 The inserts give collectors what they want with autographs and relics and offer a variety of design styles. In an interesting move Topps created the Title Belt Plate insert where the cards contain an actual miniature replica of the title belt won by the fighter. With this UFC set there are also parallels; Onyx/Black #/88, Red #/8 and Diamond 1/1. Without knowing the price point I will give this set a solid 4 rating. A decent price can increase that rating to at least 4 ½. The only downside that I see is the use of stickers on some inserts while other autographs appear to be on-card/on-relic. I understand UFC fighters train all year and will usually fight at least twice a year but they often have some significant time off and Topps should easily be able to get the cards to the fighters to sign on-card. I don’t think it would be a logistical nightmare to organize card signings for 50 fighters. In 1979, at the age of 7 I moved to Tucson. My dad used to bring us to Wildcat games every season and I looked forward to the time because I got to see a live football game and spend time with my father. Over the years I saw plenty of talent come through the desert from Alfred Jenkins (I know, he made some bad choices in life after football) and David Adams to Chris and Kevin Singleton and the Desert Swarm years up through todays’ young players like Nick Foles, who may still prove to be an NFL caliber QB. This season started out so well but went bad ending with 4 straight regular season losses. The Alamo Bowl game turned out to be a tough loss but as a true fan I take it in stride. There is one things that the Wildcats have proven is that there are good years and there are bad years but no matter what we always Bear Down… not to mention that the basketball team opens up Pac-10 play Thursday night at Oregon. Watching the end of the Wildcat’s football season tonight brought me down memory lane and it got me thinking about the most memorable highlights from all of the games that I have seen over the past 30 years and one sticks out above the rest. It was 1986, the Sun Devils were already Rose Bowl bound, the Wildcats were heading to the Aloha Bowl, and the game was all about The Streak (U of A went 8-0-1 vs. ASU between 1982 through 1990). The game had some exciting moments like the goal line stand by the Cats but the most memorable moment from the 34-17 Wildcats win was Chuck Cecil’s 106-yard interception return for a TD. I was 14 and living in Tucson at the time and 24 years later I still remember the game as if it happened yesterday. 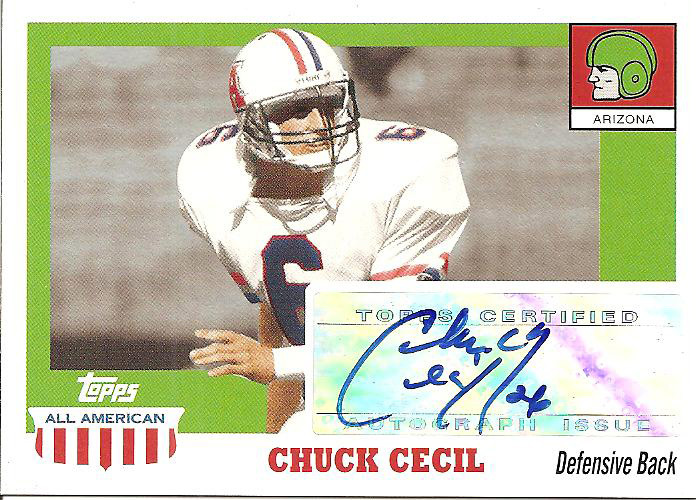 When Topps released the 2005 Topps All-American set and I saw Chuck Cecil was on the autograph checklist I knew I had to have the card. Cecil and Steve Kerr are my two favorite athletes to come out of the University of Arizona and both have a prominent place in my personal collection. I find it appropriate that as I watch a replay of Strikeforce: Houston I write up the final random blaster box review of the year, Topps UFC 2010 Round 4. Back in May when I wrote up a review of the Topps UFC 2010 release I was impressed. I love the look of the set and I think that Topps did an amazing job all around. The checklist is complete, the design works well with the UFC theme, the inserts are in line with what is expected and while there are some parallels they are not so intense that it is overwhelming. Rounding out the set is a nice selection of autographs and original relics including actual fight used tape. I am very satisfied with my blaster box, I got a nice selection of fighters including old-time favorite; Royce Gracie. 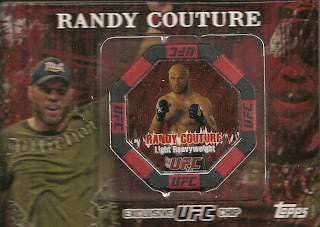 I pulled 4 gold parallels with my favorite being the Randy Couture. The gold parallels are a heavier stock then the base cards along with gold foiling. There are also Onyx (#/188), Ruby (#/8) and Diamond (1/1) parallels for each base card along with the unnumbered Gold versions. The Bloodlines insert is very cool with each fighter shown with their countries flag; there is also an autographed version of this set. I pulled George Sotiropoulos, a Greek-Australian fighter who has a 14-2 MMA record and is a contender for the UFC Lightweight Championship. Additionally I pulled a Rashad Evans Octagon of Honor insert and a Quinton Jackson Pride and Glory insert. I find it funny that I found an Evans and Jackson insert in the same box, the reason being that they actually just fought this past May at UFC 114 with Evans coming out on top. 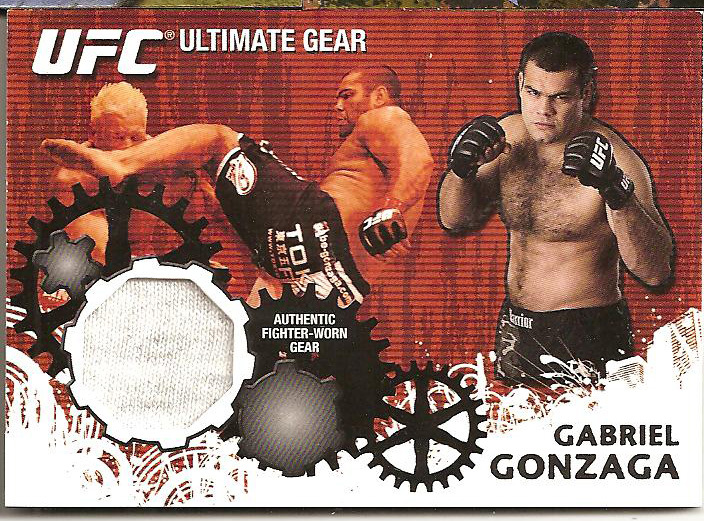 Each UFC 2010 blaster box contains an “exclusive” octagon chip card. The first series of 15 chips were included in the retail blasters of 2010 UFC Main Event and the second series of 15 chips were included in the UFC 2010 Round 4 blasters. 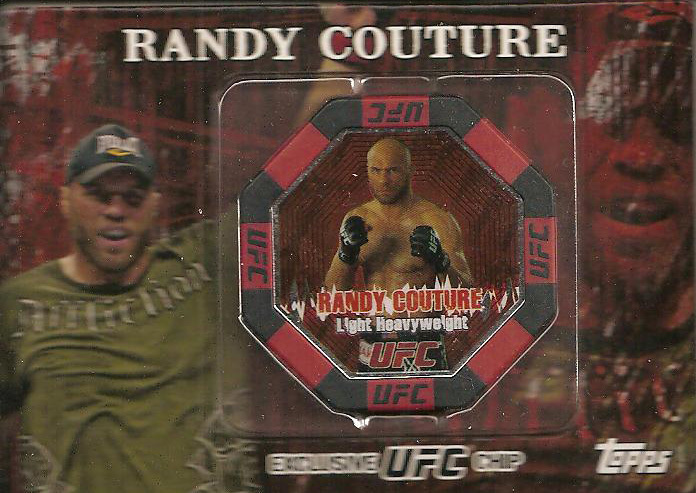 I happily pulled Card #19 Randy Couture. 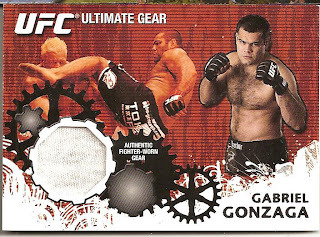 My last pack included an amazing surprise, an Ultimate Gear Gabriel Gonzaga T-shirt relic card. The Ultimate Gear relics are seeded at 1:82 in retail packs so this was totally unexpected. In a turn of unfortunate luck Gonzaga was just cut by UFC in October after going 1-3 since 2009 which is sad considering that he was 10-3 at the end of 2008 including a KO over Cro Cop at UFC 70 which made him the #1 contender for the Heavyweight title. I checked the original checklist for Ultimate Gear relics and Gonzaga was not even listed, I guess I shouldn’t complain because I beat the odds by pulling a very cool insert but when the Ultimate Gear relics checklist includes BJ Penn, Liddell, Evans, Hughes, Ortiz, Brock Lesnar and GSP I should be able to have a little to gripe about when I pull a down and out fighter not even on the checklist and no longer even in UFC. 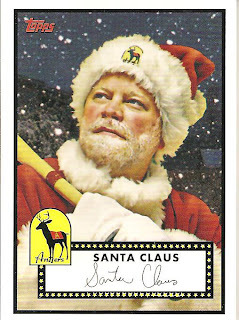 As Santa Claus finishes the tail end of his journey, according to NORAD he is currently in Anchorage, Alaska, I am focusing completely on some of his special cards that have graced the collecting community from his 1952 Topps Rookie card to a handful of autographs and memorabilia cards. 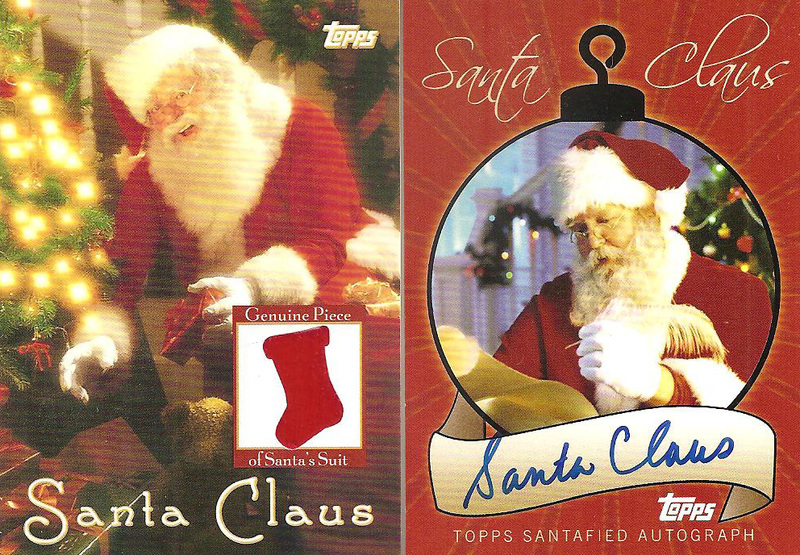 His Topps autograph and relic cards (along with the '52 Topps rookie) found their way in to my collection a couple of years ago when Topps released an 18 card Santa Claus set in 2007. After Christmas Target had the sets on sale for around $5 each, not a bad deal for 16 base cards plus an autograph and memorabilia card of everyone’s favorite jolly old elf. 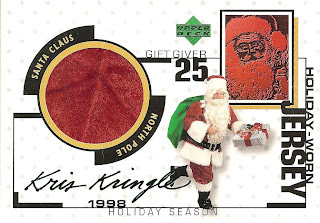 By far the Upper Deck Holiday-Worn Jersey employee card is my favorite. 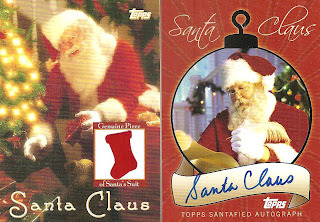 The card was handed out to Upper Deck employees and special customers in 1998. 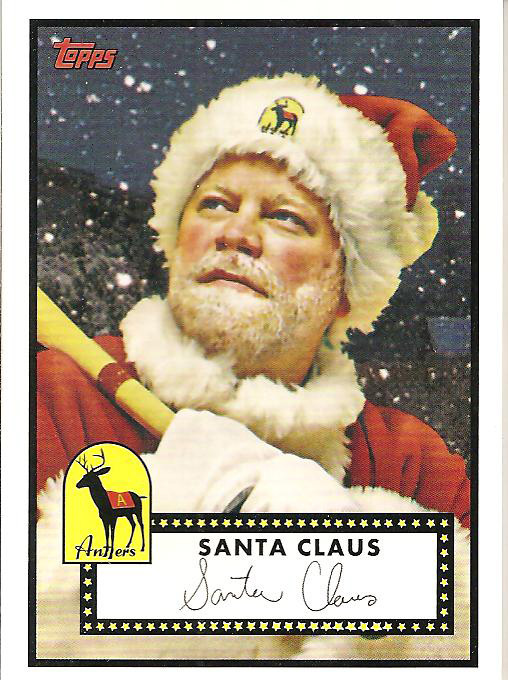 The reason I like it is because it is a jumbo oversized card at 3 ½” x 5” and Santa’s “jersey” relic piece is the size of a half dollar. I actually leave the card out on display all year long along with my Ken Griffey Jr Santa Hat relic card, another jumbo relic card from Upper Deck. 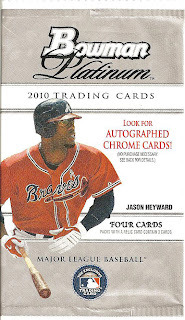 While out doing some last minute shopping last night I decided to pick up a Bowman Platinum value pack after seeing The Mojo Hand’s review a couple of days ago. The value pack gives you 3 packs, 4 cards each pack, plus an additional 3 Purple Refractors exclusive to the value packs and they cost $9 each. The set is rather small, 100 cards made up of stars, prospects and rookies plus an additional 50 card Platinum Prospects checklist containing prospects so the entire set is only 150 total cards not counting parallels/refractors. Like the typical Bowman release this is a product for the prospectors out there hoping to find the next young star. I pulled a decent selection of stars from the base set; Vladimir Guerrero, Jared Weaver, Carl Crawford and A-Rod plus a Mike Stanton rookie card. From the Platinum Prospects I pulled Desmond Jennings plus a trio from the National team; Sonny Gray, George Springer and a Platinum Parallel Sean Gilmartin #/999. The exclusive Purple Refractors I pulled are Mike Trout, Chris Withrow and Nick Ramirez from the National team. These refractors are purple and have the nice refractor shine to them but they are not numbered. In typical Topps style a number of the cards include smudging, scratches and the Gilmartin parallel has 3 problems, one pin prick by his right ear another above the “M” below the BP logo and a deep scratch across the “G” in his name. Sadly I expected as much as far as the damage. If I was building a set I would be much more selective about the damage and would probably consider sending some back to Topps but seeing that these will just go in to a storage box I am not upset about the imperfections, but quality control seriously needs to be addressed by Topps. 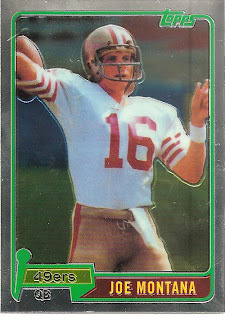 Do we really need another retro set from Topps? Chicle and Topps 206 were never really a success among collectors; honestly they were just half-assed attempts in the end hoping to drum up some sales dollars from the vintage collectors. Now Topps thinks that Gypsy Queen will help bolster their stale lineup? Allen & Ginter has run its course; they really need to let the series die with dignity but Topps keeps beating the old horse hoping there is still one more race out of the old gal. I cannot understand why Topps, which has 20 different products this coming year, feels it is necessary to add another retro to the lineup. Instead of putting out stale products and hoping to tie in to nostalgia why not cut the list down in half and focus on product design instead? Stick to a base series, a mid-level series and a high end product for each licensing. Cut the sticker autographs, gimmick cards, redemptions and parallels and put out a quality lineup, trust me people will buy boxes if the cards look good. I am trying to finish up the last of my random blaster boxes/packs that I have sitting on my dresser before the end of the year and after tonight’s Topps Chrome Football I am down to just a blaster of Topps UFC. 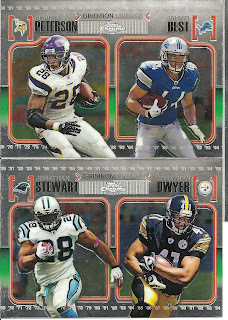 I picked up a blaster of 2010 Topps Chrome Football along with a rack pack and a couple of individual packs and I decided to just lump everything together in one review. The football release does not seem to rub me like the baseball release, may be because the action shots in football are more fun to look at add in that I pulled a pretty decent selection of cards with only 1 double from 15 packs and that was a very cool CJ Spiller Bowman Chrome rookie too. 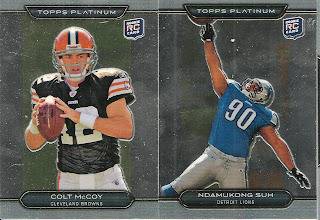 Finally none of my football cards have the typical Chrome bend to them so that is a plus. 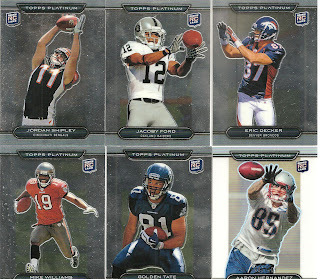 This was a pretty good selection of players; Matt Hasselbeck, Aaron Rodgers, Drew Brees, Wes Welker and Calvin Johnson among the regular base cards. I also pulled some decent refractors including a Refractor Beanie Wells, a Blue Refractor Dallas Clark and Orange Refractors of Reggie Bush and Steve Smith. This year has not been a bumper crop of rookies with many of the early expectations going down with injuries or never really fulfilling the prophecies. I pulled 24 rookie cards all together with the most notable pulls; Dexter McCluster, Mike Williams and Ben Tate. 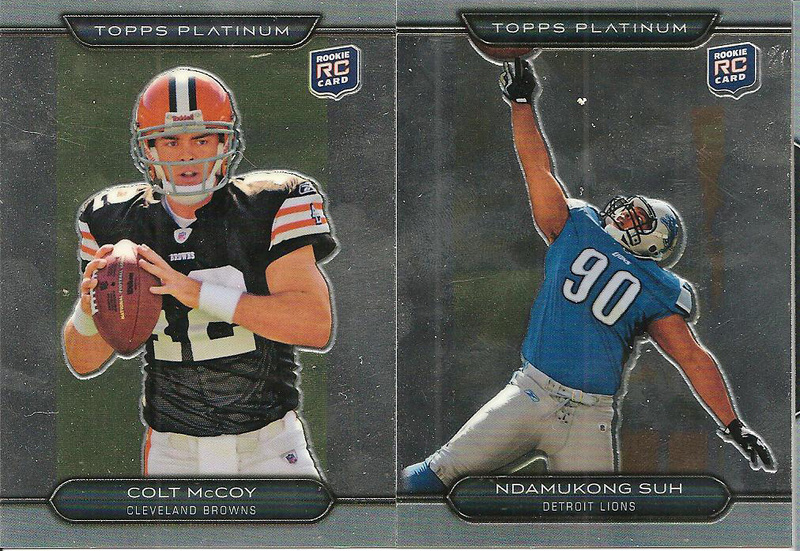 Add in an Orange refractor of Jacoby Ford, Purple Refractor of Jordan Shipley and an X-fractor of Earl Thomas. I pulled a double of C.J. Spiller Bowman Chrome rookie and while his season has not hit expectations there is still hope for him in the future. The Joe Montana Rookie Reprint is cool, though I think I like the original card better over the chrome version. A couple of Gridiron Lineage rounded out my experience; Jonathan Stewart/Jonathan Dwyer and Adrian Peterson/Javid Best. I just noticed on the back of the packs differences between the odds in some of the hits. I know that there are differences between Hobby and Retail packs but I have not seen differences between Retail packs before. The Blaster Box Blue Refractors are 1:53 and the Rack Pack/Individual Packs Blue Refractors are 1:52 and the Blaster Triple Rookie Autograph Refractors are 1:287,000 where the Rack Packs Triple Rookie Autograph Refractors are 1:129,000. This was overall a very good round of packs for me, lots of players I like and a handful of players that can possibly turn out to be solid producers for their teams in the future. I decided to go in a different direction tonight and talk about cards based on an upcoming movie, The Green Hornet. About 15-20 years ago comic books were big time business. There were two definites at that time when it came to graphic novels, first the comic books were awesome and second the movies tied to the comic book were crap. Need reminding, take a look at the original Fantastic Four (1994) movie, it was so bad that it was killed before being released. It was not until X-Men came out in 2000 when people finally gave super hero movies another look. 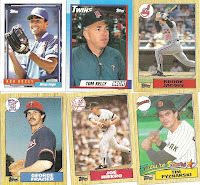 At the time Marvel and Fleer hooked up to release some of the more memorable comic sets in the 1990s. Rittenhouse has taken the reigns and is now the leader with both comic and live action movie super hero cards. The Green Hornet is being released to theaters on January 14, 2011 with Seth Rogen taking on the lead role of Britt Reid/Green Hornet and Jay Chou as Kato. 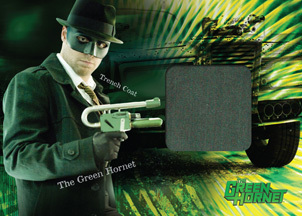 Rittenhouse has created a 17 card Green Hornet set that will be released a few days before the movie, each set will sell directly through Rittenhouse for $50 each. 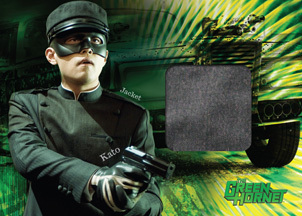 The set contains 14 base cards: 7 Green Hornet action cards and 7 Kato action cards. 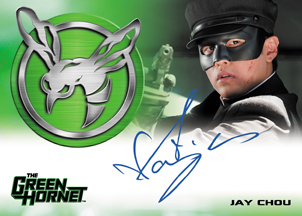 There are 3 “hits” per set; 1 Kato relic card, 1 Green Hornet relic card and an autographed Jay Chou card. I would like to have seen a Seth Rogen autograph card; his autographs are pretty difficult to come across and can run over $50 or more for an autographed 8x10 picture so an auto card would have been a big hit for collectors. The hits are nice but I am not sure if this set is really worth $50 each. 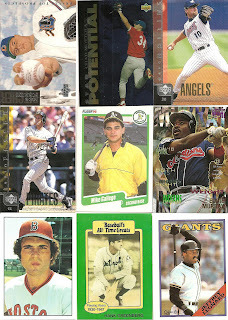 If there are some comic book/sports card collectors out there I would like to hear your input on the subject. I am not a fan of chrome, foil or any of those other materials to make a card shiny but just like I gave the various Chrome releases a chance I decided to grab up a blaster of Topps Platinum. 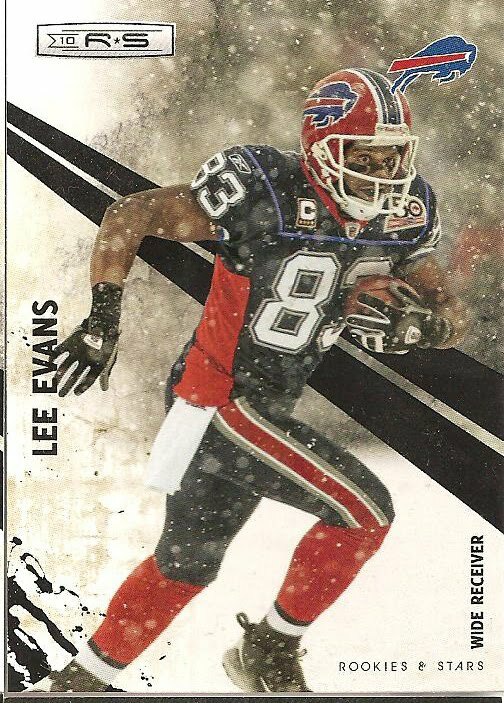 I like the action shots used but the layout and foil had me seeing flashbacks to the 2006 Leaf Limited set. 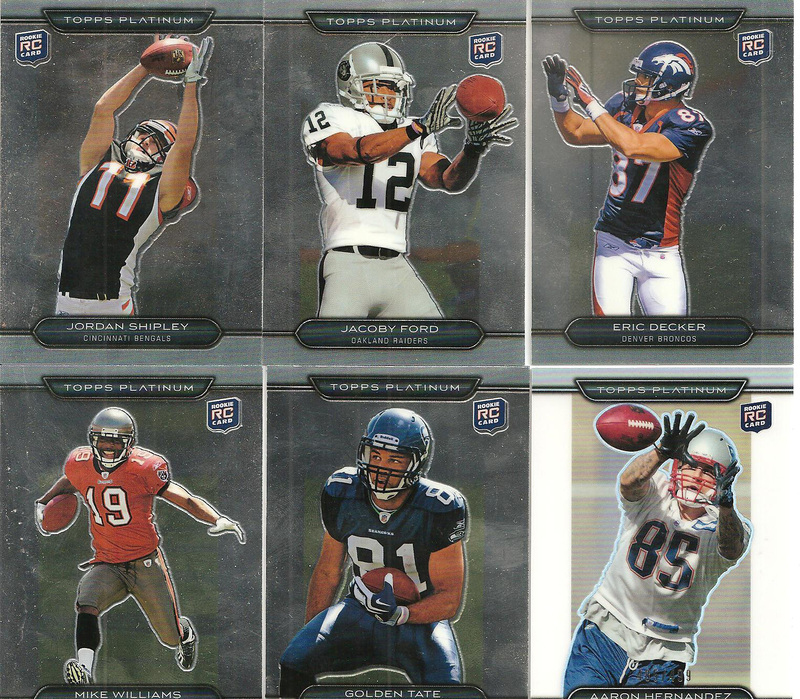 My box was all about rookie Wide Receivers with 13 of my 18 rookies being a receiver or TE. I am pretty happy with my pulls too with the best of the group being Mike Williams and Jordan Shipley followed by KR Jacoby Ford and Eric Decker and PR Golden Tate (I had to smile pulling this Seahawk rookie). I was surprised when I pulled a White Refractor #/499, they are 1:46 packs, of Patriot’s WR Aaron Hernandez, who is having a decent season up in New England. 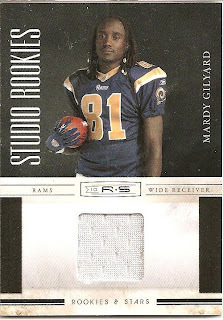 Of course Mardy Gilyard made it in to my box; he was one of those extra thick rookie cards. My other rookies were QBs Colt McCoy, Dan LeFevour and Zac Robinson along with DL and part-time horrible kicker Ndamukong Suh and DB Eric Berry. 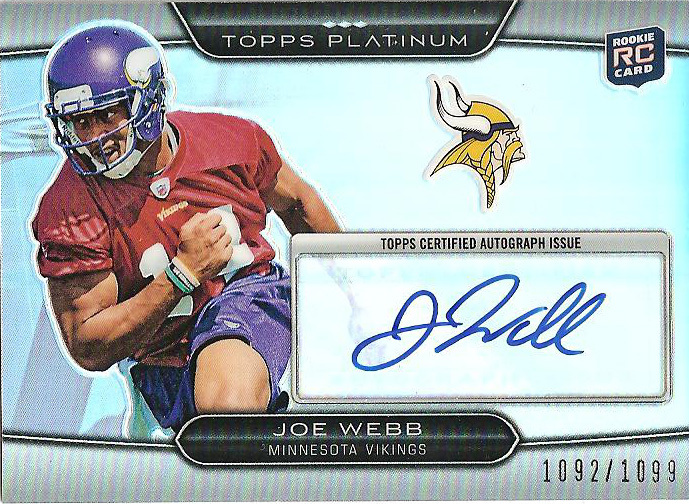 The autograph I pulled is of Vikings Joe Webb, the man was drafted with the intention of playing receiver for the Vikes but in a turn of events will be lining up under center Monday night against the Bears in a game that has suddenly drawn the attention of many sports fans for various reasons. Even though I do not really care for the set I do like this card because the design. A decent picture of Webb, the team logo stands out nicely and the autograph (besides being a sticker) is well placed within the design. Why Do Card Designers Insist On Frankencuts? 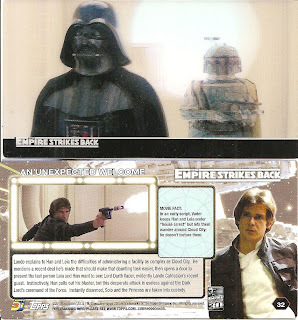 Why does Topps have to take a very cool idea and turn it in to a monstrosity? That is exactly what has come out of 2010 Topps Tribute with the Legendary Lineup cut signature card. To get to the gist of my rant, Topps should have created 9 separate cut signature cards that could have been awarded to one lucky collector who pulls the special redemption card. Instead they take 9 cut signatures and jam them together on a 6-panel booklet card. Way to ruin 9 autographs Topps with your Frankencuts booklet. The New York Yankees Legendary Lineup card was just put up for auction using Beckett’s consignment auction with a starting bid of $20,000 and no reserve. 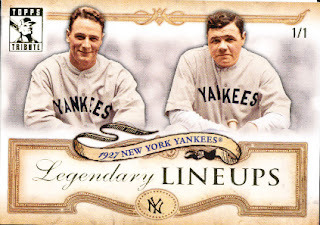 The card contains the 9 signatures of the 1927 New York Yankees Murders Row, one of the best lineups every to take the field. And Beckett called this the “Coolest Cut Ever”? I think Upper Deck may have something to say about that, their SP Legendary Cuts releases are some of the best cut signature cards out there. A couple of months ago Leaf released the 2010 Leaf MMA set, a solid set featuring some of the top in the mixed martial arts field, which was reason enough to buy a box or two and since the initial release the price has dropped significantly, basically in half going from $120/box to around $65/box. The best part though is that you can exchange 96 wrappers for an exclusive Mauricio Rua autograph card #/85 that was created specifically for the wrapper redemption program. Shogun Rua is currently the Light Heavyweight Champion and depending on his knee surgery recovery, is scheduled to fight a re-match against Rashad Evans in March 2011 at UFC 128 or UFC 129. Given 96 wrapper is 12 boxes worth of busting and at the current $65/box comes out to $780, you will probably be able to pick up the card for quite a bit less once released and even cheaper if he loses the Evans but for those who are dealing with box and case breaks this might be a good reason to wrangle up those wrappers. 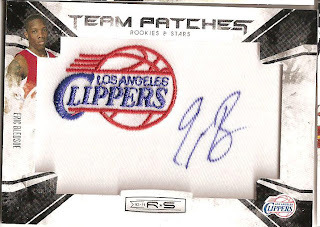 I am not sure why I keep grabbing for the Rookies and Stars product, I am not a fan of the design but yet I apparently am a glutton for punishment. My most recent round of punishment is the 2010-11 Rookie and Stars Basketball. I admit that the artistic style used with the player images works better with basketball then it does with football and the background design is more acceptable for similar reasons but still Panini needs to do something about the random angles and paint strokes that adorn so many of their products. This blaster by far is better than the Rookies & Stars NFL blaster that I busted last month. Starting on a positive note I pulled an elderly trio of Suns with Steve Nash, Grant Hill and Hedo Turkoglu along with ex-Sun Amar’e Stoudamire in his Knicks uniform. I am not sure if it is true or not but I heard that the Suns are going to be sponsored by AARP soon (just joking). 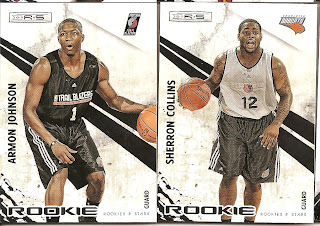 I pulled two rookies; undrafted Sherron Collins, who was just demoted to the D-League yesterday after starting the season as the third string PG on the Charlotte Bobcats bench. 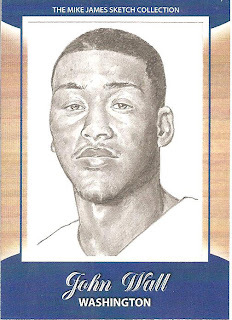 The guy led the Kansas Jayhawks to an NCAA Basketball Championship in 2008 and to 3 Big-12 titles so you know he can play but will that transition to the NBA? The second rookie is Armon Johnson, the #34 pick of the Trail Blazers. Johnson is the second string PG behind Andre Miller and is averaging 3.9 PPG in just under 11 minutes a game. The hit is an autographed manufactured team patch from LA Clippers PG Eric Bledsoe. I know a lot of people do not care for the manufactured patches but I am a fan. It serves as a nice canvas for the players autograph and includes the team logo. The only downside would be that the player’s image and name is tiny, just about thumbnail size. I was at the Dollar Store last night and I came across a small section of cards and amongst the packs of various Disney movie cards and 2008 Topps Update packs I came across some of those re-pack packs containing “Historic Star Cards” so I figured for a buck it didn’t really matter what I ended up pulling. Am I wrong, does the cartoon batter on the wrapper bear a striking cartoonish resemblance to McGwire? I assumed two things, I was not going to pull that pristine copy of Nolan Ryan’s 1968 Topps rookie card and second, I was going to pull a lot of junk wax. Needless to say I was correct on both assumptions. 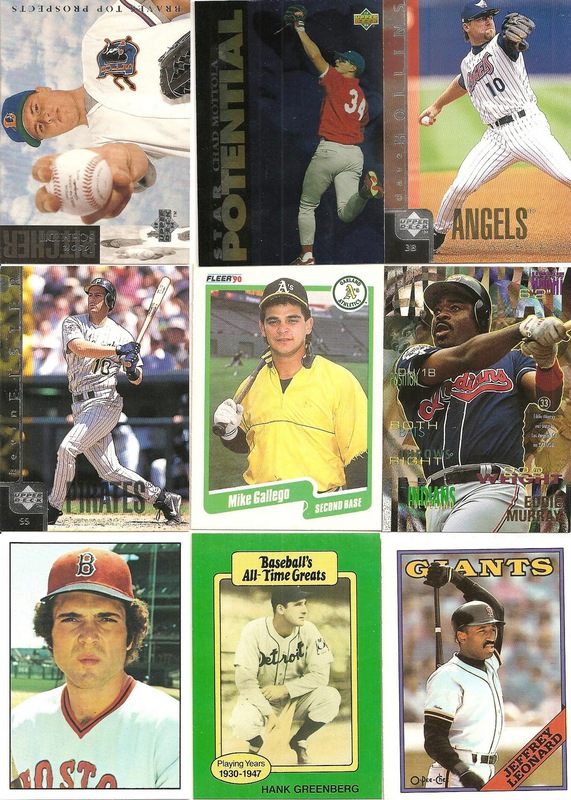 A couple of HOF players (Greenberg and Murray), a hand full of mediocre players, a Two-time World Series winning manager and plenty of lost opportunities not to mention a couple of cards that I have no idea of origination (Greenberg and Carbo). 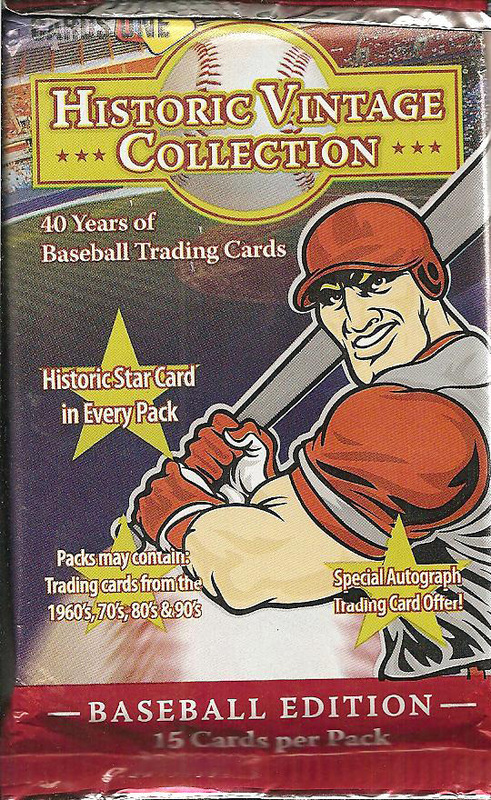 I figure that the green Hank Greenberg card is probably the “Historic Star Card” that the wrapper promised me. I got what I paid for in the end and it took me down a journey of over-produced junk wax where every player drafted was considered a “Future Star” by the card designers. Press Pass Five Star, Expensive But Well Worth It! 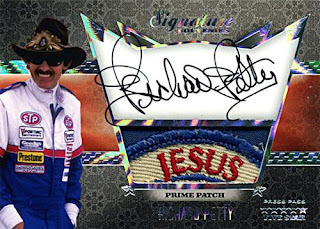 Press Pass, a card designer that at one time produced NCAA cards has turned their full attention to NASCAR collectors. NASCAR cards have been attempted by most of the major card designers including Donurss, Upper Deck and Fleer with limited success but Press Pass has been able to succeed with racing for almost 20 years along with producing die case miniatures. This is the company that introduced relics in to cards with their 1996 Burning Rubber inserts that contained an actual race-used tire piece. Later that year they started to include pieces of fire suits and sheet metal in some of their inserts and the relic age was born. With the recently released Press Pass Five Star set you can pull a redemption card, not any redemption card though. 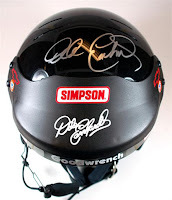 These redemption cards are instant win cards for complete items like a 1993 Winston Cup Dale Earnhardt race-used/autographed helmet or you can pull a card for a 1999 Tony Stewart Home Depot fire suit. No longer will your redemption be for a dime-sized fire suit relic but for the entire fire suit. How cool is that? The checklist is pretty strong too with early NASCAR racers along side the giants of today and even some of the up and comers. The checklist includes Earnhardt, Jr, Richard Petty, Gordon, Stewart, Danica Patrick and of course Double J Jimmie Johnson. A quick look at eBay﻿ and the base cards along with some of the more basic relic cards can be had for a few dollars but the Prime Autograph patches and some of the booklet cards are already topping $100 with time left in the auction. It looks like this might actually be one of those high dollar sets where you can actually get a decent return on the box. On an interesting note Press Pass employees wore white cotton gloves when they packed out each box, which are made from real Chestnut wood, to ensure that you received a box in pristine condition sans fingerprints. The cards are 120 pt stock or higher and every autograph is hard signed on the card. Thank you Press Pass for an amazing release. Other card designers need to take note because this is how you do a high end set. 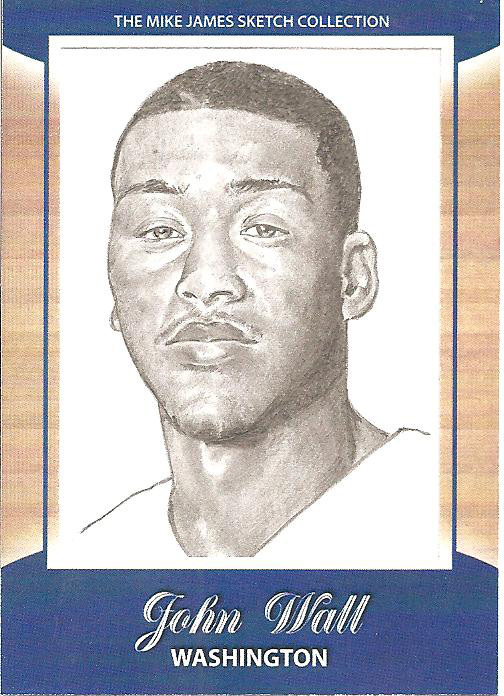 Congratulations, you win the John Wall sketch card by artist Mike James. Send me an email with your information and address and I will send the card out this week. I want to thank everyone for joining the contest and I want to send out a personal thanks to those that helped me get things started and supported me for this contest. The contest is now closed and all comments awaiting moderation have been posted. Sunday I will assign each poster a number 1-14 which I will then randomly draw using random.org. The winner will be announced here on my blog by Monday (12/6). 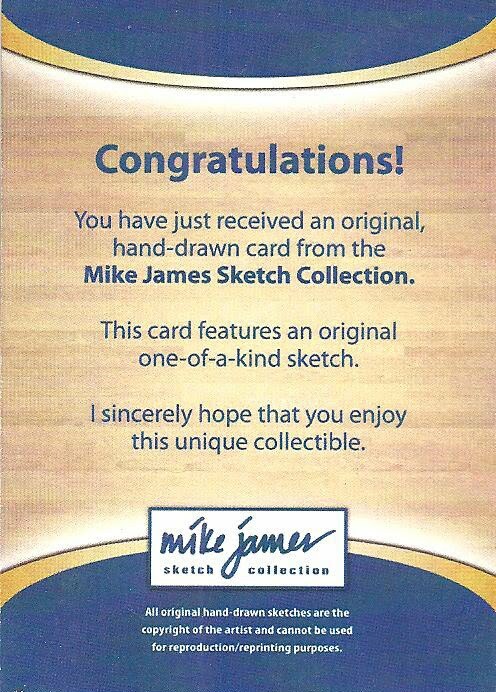 This is a contest for a one of a kind John Wall sketch card from artist Mike James. Things start as soon as I am done posting and the contest runs through Saturday December 4th with the winner announced Monday December 6th. 1- Become a follower of Pack War by clicking the FOLLOW link. 2- Please make a post on your blog talking about this contest. 3- Leave a comment here saying you have completed steps 1 & 2. 1- The contest closes at 12:00 AM (Midnight) Sunday morning 12/5/10, all three steps must be completed by 11:59 PM Saturday night 12/4/10. 2- Each contestant will be assigned a number based on their posting order. 3- Using Random.org a number will be selected, this is the winner. If you have any questions feel free to send em an email. After a year and a half of blogging I will finally be holding my first contest this week. Late Wednesday night I will be posting the rules to the contest. 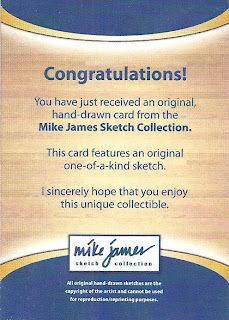 The contest winner will be receiving a Mike James 1/1 sketch card. More information will be coming Wednesday 11/24. I have included a teaser view of the back of the card, feel free to guess as to who/what is on the front. Another company steps up with the customer service and guess what… it is not Topps. I know will Topps ever really step up to the curb with their customer service? After a collector pointed out that an Antero Niittymaki emblem patch from the Finland Olympic team jersey that was inserted in the Ultimate Memorabilia 10 release was game issued but not game used In The Game decided to do the right thing and “recall” the 1/1 patch card and they will be replacing the card with a new Niittymaki Ultimate Emblem card that truly is game used. The jersey was purchased by ITG from the NHLPA and actually came with a COA from the NHLPA claiming that the jersey was worn by Niittymaki during the Finland-Belarus game on February 17, 2010 but a review of the game shows that Kiprusoff played all 60 minutes in goal. Niittymaki did not see any action at the 2010 Olympics as the team’s third goalie so none of his jerseys from the event can be considered “game used”. In a time when companies are happy with labeling a card as “player worn” or even worse, no description, it is good to see that a company is taking the right approach to the situation. When ITG describes a relic as game used you can be certain that the relic has actually been used in a game. I am not sure why I grabbed a blaster of Rookies and Stars, I have never really been a fan and this blaster just solidified my feelings towards the product. As you can see the design is very similar to last year’s layout (and the year before that and so on). Because the cards contain a player image with no football background every card actually looks the same as the next card. The only card that stood out is the Lee Evans card because they actually used a partial football background and to make it more interesting it is from a snowstorm game. I was happy to see a couple of young Cardinals, Wells and Fitzgerald, along father time himself, Matt Hasslebeck. I was a bit disappointed that the only other Seahawks that I pulled were actually players no longer suiting up in neon green, Nate Burleson (Detroit Lions), Deion Branch (Patriots) and TJ Houshmandzadeh (Baltimore Ravens). My relic was a white jersey swatch from Mardy Gilyard cut from a jersey worn at the 2010 NFL Players Rookie Premier. I have seen Gilyard way to often this year; if my hit is not a Gilyard then it is usually from Limas Sweed. Color me lucky.